The PODIUM is the official publication of Kappa Kappa Psi and Tau Beta Sigma. It is currently published twice a year in the spring and fall. The deadlines for submitting articles are November 1 for the Spring edition and May 1 for the Fall edition. 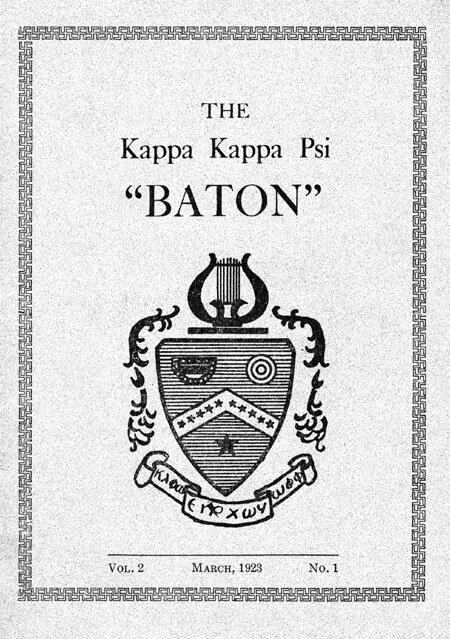 The PODIUM is the successor to Kappa Kappa Psi’s first publication, The Baton, which was published on a quarterly basis from 1922 to 1933. With the coming of the Great Depression and the Second World War, publication was discontinued on a regular basis, with only a few printed editions appearing between 1934 and 1947. A special “Sousa Edition” issue was published in May of 1933, memorializing the death of “The March King,” a Brother of the Delta Chapter. Only through the herculean efforts of Brothers A. Frank Martin (Alpha) and Joseph Davis (Upsilon) were various editions published during this period. Using a variety of media (ditto, mimeograph, three-page folded leaflet, ten-page stapled lithography, and sixteen-page hand-set, press-lettering) each issue endeavored to keep the membership together and in touch with each other. Each of the men charged with the responsibility of editing the articles that came to them from the active chapters and then sending it to all members of the Fraternity in any manner they could, under uncertain circumstances with meager financial resources, did not take their responsibilities lightly. They have left us a legacy of service and a wealth of historical material that today is being hailed by music historians as the single most important source of information on the development of the college band in America. The Fraternity is deeply indebted to those who overcame all manner of obstacles to preserve this heritage. 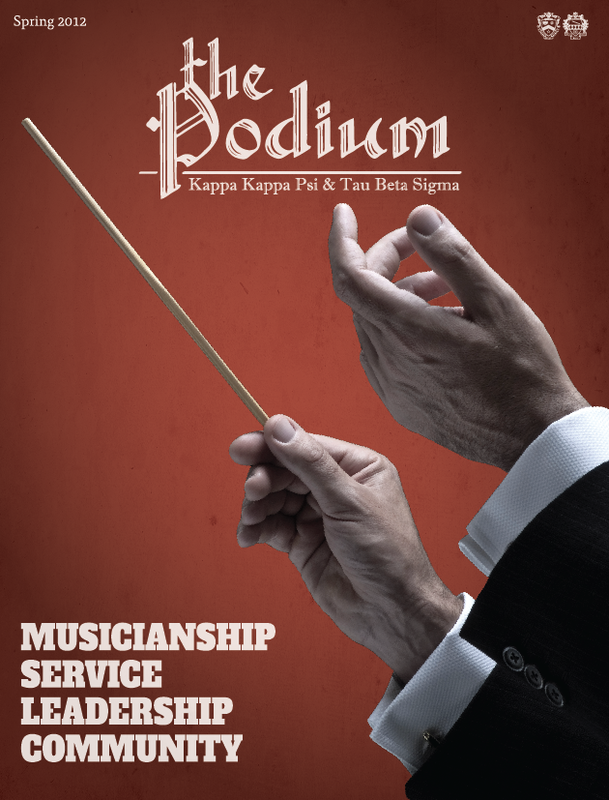 Today’s member should be aware that what they read in the pages of The PODIUM is not just a compilation of the activities of various chapters across the nation, but is the continuation of a long-standing tradition, and the present-day manifestation of a continuing responsibility to the music world that spans more than half a century. When The Baton was revived for regular publication in 1947, a title-search for copyright purposes disclosed that during the interim between 1935 and 1947, another music organization had copyrighted this title. So in 1947, The PODIUM was born, under the editorship of then National Executive Secretary, A. Frank Martin (Alpha). At the 1947 Biennial Convention, the general policies of the magazine were set up. It was also officially voted to accept Tau Beta Sigma as a sister organization, and the new Sorority was extended in perpetuity the courtesy of sharing in all of Kappa Kappa Psi’s publications. Since 1947, The PODIUM has grown steadily in both scope and circulation, until it is now considered not only a medium of idea exchange between chapters and members, but also what one music manufacturer has called, “the show-window of the college band world.” From a limited circulation of less than 500, your national publication now reaches more than 8,000 subscribers. …The PODIUM is first and foremost, a ‘house-organ’ type of magazine. It goes to an exclusive clientele, and contains materials of interest to only a particular group – those engaged in the exciting world of the college band.